Mighty Meal The Mighty Meal uses the finest all-natural ingredients with no preservatives. Only pharmaceutical quality vitamins are used to guarantee an excellent food source for those who choose a healthy lifestyle. The Mighty Meals have been tested for over two years by the Hoffman/La Roche Pharmaceutical Company, with outstanding results. The Mighty Meal is a premium meal replacement that makes it possible to obtain a healthy, optimum body weight. Please review the accompanying presentation for specific nutritional details. Try the Mighty Meal in all of the tasty flavours below: Maple, Vanilla, Caramel, Banana. Price per case (84 meals) US$210:00 plus shipping. Sampler packs available. E-mail or call us 01473 423143 (England) for more information. The Mighty Meal is designed for a variety of applications from emergency and disaster preparedness food supplies, to consumer household, non-profit organisations and corporate programs. This unique quality product is specially formulated to prevent starvation and is an ideal long term shelf life food source, that requires no water or heat to consume. 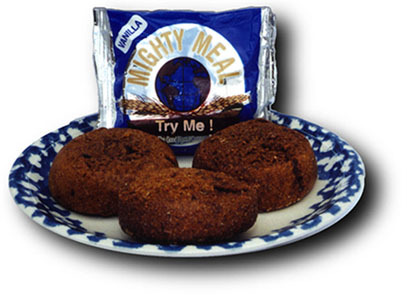 There is simply no other one-of-a-kind product developed in the world such as the Mighty Meal. encompassing both "taste" and "health", along with convenience. Just try one and discover for yourself..finally someone has created a "healthy" survival food product with taste that's "out of this world". Every family in Europe or around the globe can now store an emergency food supply that even kids love to eat. Easily carry them on your next outdoor recreational outing such as bicycling, camping, skiing, hiking, etc. and put aside a small supply in your vehicles for unexpected situations. Corporations and International Relief Organisations can now store inventories or allocate emergency food supplies in warehouses or cargo containers. Excellent for emergency and survival situations as well as disaster preparedness. A person can live on one or two Mighty Meals per day. No preparation needed, just unwrap and eat. Calcium. Essential to blood clotting and the structure cell membranes. Builds bone and helps prevent osteoporosis, back pain and tooth loss. Magnesium. Builds bone, helps regulate heart function activates enzyme systems and is involved in the conversion of bodily fuels to energy. Potassium. Works with sodium to regulate blood pressure and transmit nerve impulses and with magnesium regulate heart function, also involved in protein and carbohydrate metabolism. Iron. Essential element in haemoglobin (which carries oxygen in red blood cells) and myoglobin (which does the same in muscle cells). Lack of this important mineral contributes to malnutrition, stunted growth, impaired child development, learning disabilities and reduced resistance to disease. Zinc. Promotes healing and growth, maintains immune function. B Vitamins. These vitamins are involved in the regulation of nervous system activity, maintenance of nerve growth and protection of nerve cells. Also aids in breakdown and forming of amino acids and forming and regeneration of red blood cells. Vitamin C. Functions as an antioxidant, promotes healing, fights infection and increases iron absorption. Vitamin D. Helps build bone and teeth and maintain levels of calcium and phosphorous in blood, regulates many cellular functions including cell division and metabolic activity.